Just a day after news broke that Marvel had tapped Sinister filmmaker Scott Derrickson to direct their big screen adaptation of Doctor Strange, BadassDigest has hinted at one of the stars currently being considered for the film’s lead role. 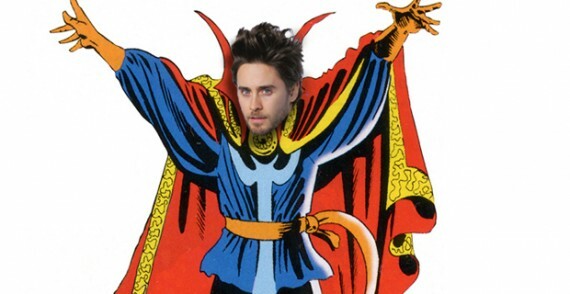 According to a post made last night, writer Devin Faraci claims to know that Academy Award winner and 30 Seconds To Mars’ frontman Jared Leto is currently in talks to become Stephen Strange for the planned 2017 film. If true, the film would mark Leto’s first venture into the world of comic book films and would likely be followed with one of the internet’s biggest fits of nerd rage in recent memory. He’s a good actor, don’t get me wrong, but I just don’t see him fitting the role of cocky neurosurgeon turned planet protecting magic wizard. Doctor Strange has three years before its scheduled release, so there is plenty of time for this rumor to go away and for another dozen or so to take its place. Personally, I think Clive Owen would make a great Strange, but it seems Marvel wants to skew things a bit younger. We’ll bring you more as soon as additional information becomes available. Leto’s only 6 or 7 years younger than Owen but he sure as hell looks 20 years younger than him.